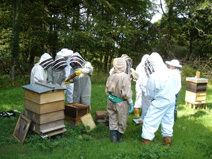 Welcome to the website of the Holsworthy branch of the Devon Beekeepers Association. We hope that the website will be of interest to branch members, other beekeepers and anyone who would like to know more about the fascinating world of beekeeping. The Holsworthy branch has members from a wide area around the town of Holsworthy in north-west Devon and from near-by north Cornwall. During the winter we have monthly indoor meetings on beekeeping and related topics and during the spring and summer we hold weekly practical meetings at our own apiary. All who are interested in beekeeping are very welcome to attend the meetings, full details can be found on the calendar page. We hope that once you have attended a meeting you will want to join us as a fully paid up member. During the winter we run a theory course for anyone who is interested in starting to keep bees or who already has a colony but finds that the bees are not doing what they are expected to do! Full details of membership of the Devon Beekeepers Association and the Holsworthy Branch can be found on the membership page or by contacting the membership secretary - see contact page for details.